Can do this Sat if needed, in the morning only though. Put me down for the next training session David, I'm officially retired from the 20th July. I can do this Saturday If required, then I'm off to France fishing for the week. Steve, do you want to meet down there in the morning as there should be 2 people. Just let me know what time. One thing from today we need two buckets, one to keep them in before measuring, one for after. Today had to make 7 trips to send them on their way. Steve you have a white bucket from the Riverfly day, can you take that down mate and I will swap it over with another next week. Also pen and paper, again need to leave one there, thought it was but there you go. Steve you have a white bucket from the Riverfly day, can you take that down mate and I will swap it over with another next week. No problem - got 2 of those divider containers we used for the river bugs in the boot aswell. Will hold onto them but leave the bucket at the lock....and pen n paper. Good shout Glyn. Does 10am suit you at all? Can do bit later if not? Steve, 10am is fine with me. I will see you there. 10am done, see you there Glyn. We found zero eels today. All that was in the trap was 1 dead mitten 23mm. Strange one week to the next, thanks for getting down there chaps. Keith, are you free Thursday mate, say late morning ? 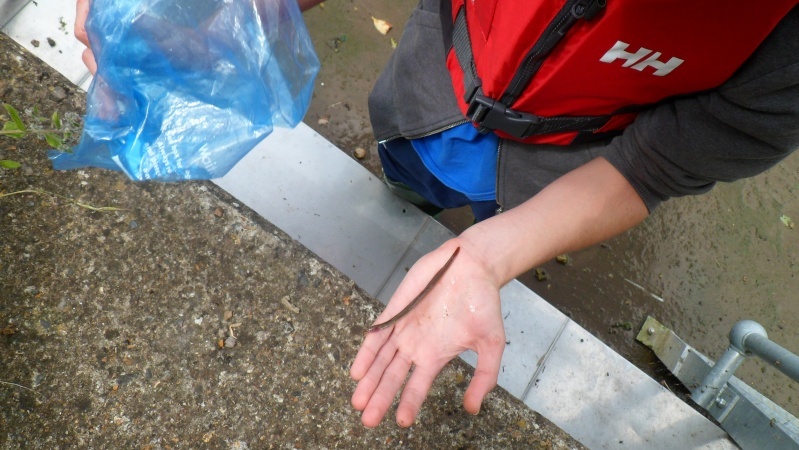 Trap contained one 120mm / 12cm Eel and no mittens. Happy to do this weekend's check. Steve when do you want to do it.How about 10am Saturday but I am flexible. The river is on red boards for about 20 locks above Molesey, so will still be raging at the weekend. Does that mean we shouldn't visit the trap until it calms down? Best is to gauge it on the day mate, if its piling over that area then no leave it, not worth any risk. Yep I'm sure it'll be fine.